Pepper mania has hit; at least that is if you sowed any seeds in your spring garden. Before that expected October frost takes out any of your remaining peppers, add some Thursday kick with this quick easy drying trick. So what’s peppering in your garden? We only plant the Ouchy mama peppers; so hot you want to make sure you’re protected when handling them. One wrong move and you know you hit the pepper’s inner white lining, which is where all the heat in the pepper resides. So consider that your surgeon general’s warning. Want to keep this sizzling heat all winter? First, the given. 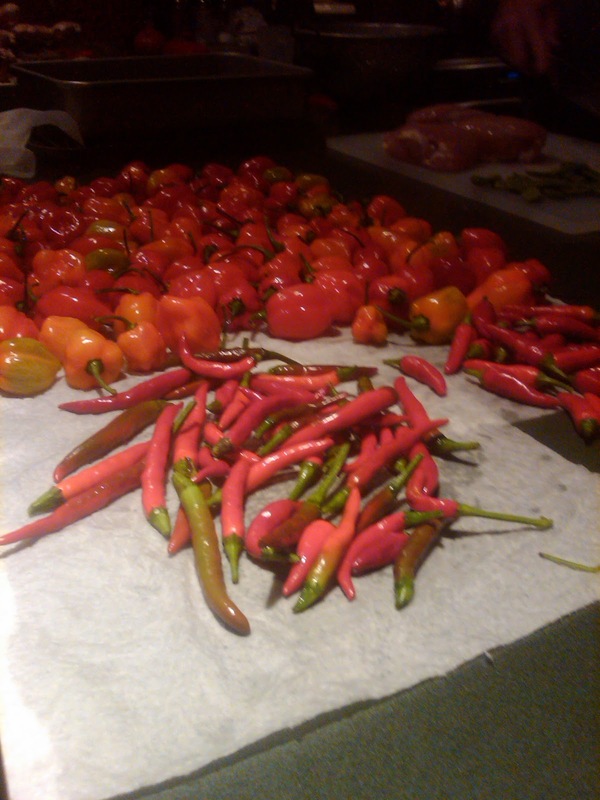 Wash and lay out the peppers to air dry on paper towels. 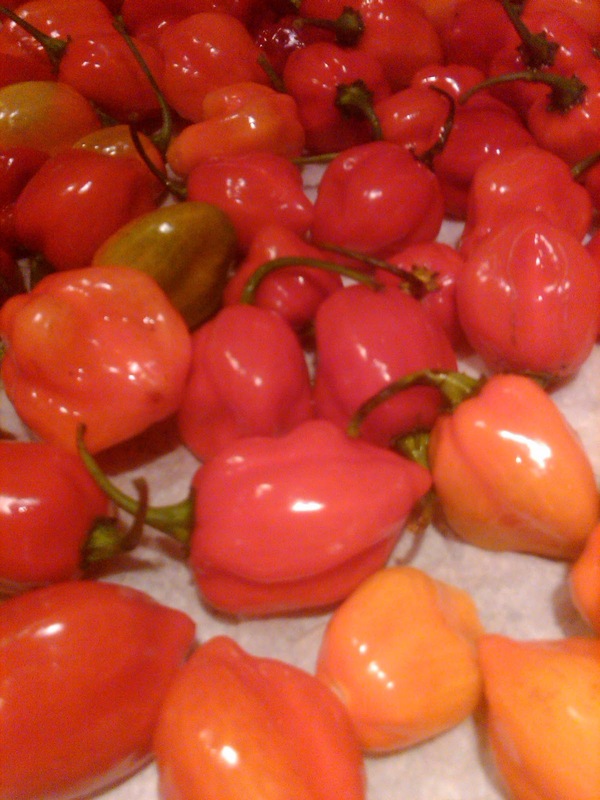 For the habanero chili, the king of Hots, you can cut the stems and slice in halves. Place peppers on a cookie sheet lined with aluminum foil. Turn your oven to 200 degrees for overnight; another sleeper button recipe. When they come out all shriveled up, you can crush them or grind them into a powder. 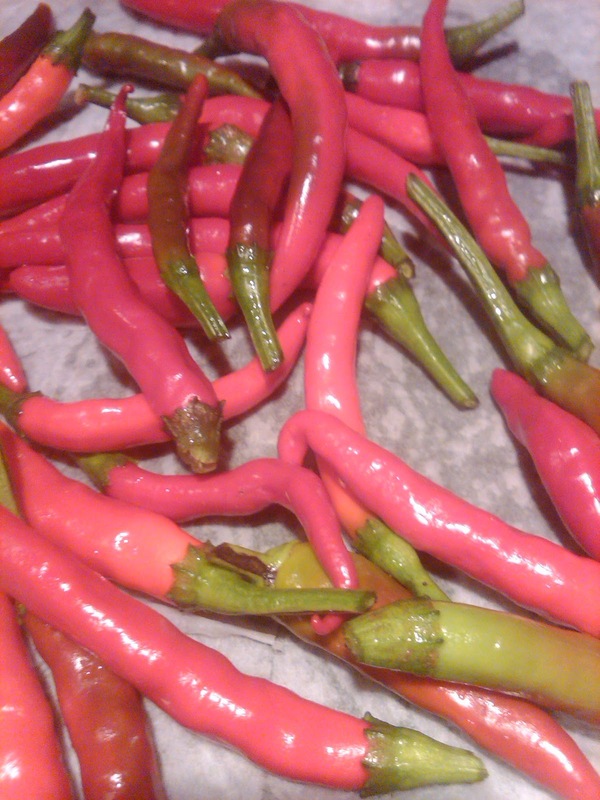 The skinny looking ones are Thai chili peppers, which can go in the oven as is. No cutting involved. Cool and store in baggies in your pantry or you can freeze them. This keeps the flavor intensity a bit longer. So that’s Thursday’s heat as things start to cool down in the garden. It’s time to wrap it up with a profound Buddha quote, which has absolutely nothing to do with peppers, cooking, gardening but prove to be wise words nonetheless. “Holding on to anger is like grasping a hot coal with the intent of throwing it at someone else; you are the one who gets burned.” Same thing with peppers!